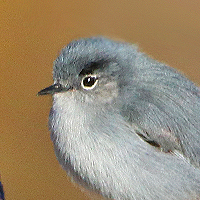 The 15 to 20 species of small passerine birds in the gnatcatcher family occur in North and South America (except for the far south and the high Andean regions). Most species of this mainly tropical and subtropical group are resident. They are close relatives of the wrens. These dainty birds are intermediate between Old World warblers and wrens in their structure and habits, moving restlessly through foliage seeking insects. The gnatcatchers are mainly soft bluish grey in color and have the typical insectivore's long sharp bill. Many species have distinctive black head patterns (especially males) and long, regularly cocked, black-and-white tails. A kinglet, or crest, is a small bird in a group that is sometimes included in the Old World warblers, but is frequently placed in its own family, Regulidae, because of resemblance to titmice. Regulidae is derived from the Latin word regulus for petty king or prince, and refers to the colored crowns of adult birds. Utah has 2 species of Gnatcatchers and 2 species of Kinglets.